Exhibit A: today’s New York Times politics section. The on-line version shows the rapid evolution of a news organization from what used to be a print-only operation into a full-fledged multimedia operation. –A dynamic map of the Electoral College vote totals. –Many color photos, including a slideshow. Plus, a trip through the Times photo archives with a b&w slideshow from 1968. –Videos of the key speeches. –Blog posts by beat reporters discussing their specialties. –An old-fashioned “lede-all” main story, but one that has 416 comments (and counting). –A behind-the scenes “TimesCast” in which a Times editor interviews a Times reporter. –More than a dozen sidebars. –Lots of old-fashioned “eat-your-peas” civics information, including a helpful side-by-side comparison of the two party platforms. –Material carried forward from the GOP convention (which newspapers could never do when they were print-only). –An interactive feature about undecided voters. –An iPhone App, twitter feeds, a Facebook page. . . It just goes on and on. All of which raises a question: which business is the New York Times really in? After more than 150 years in the newspaper business, I would say the Times can say it is in the news business, period. 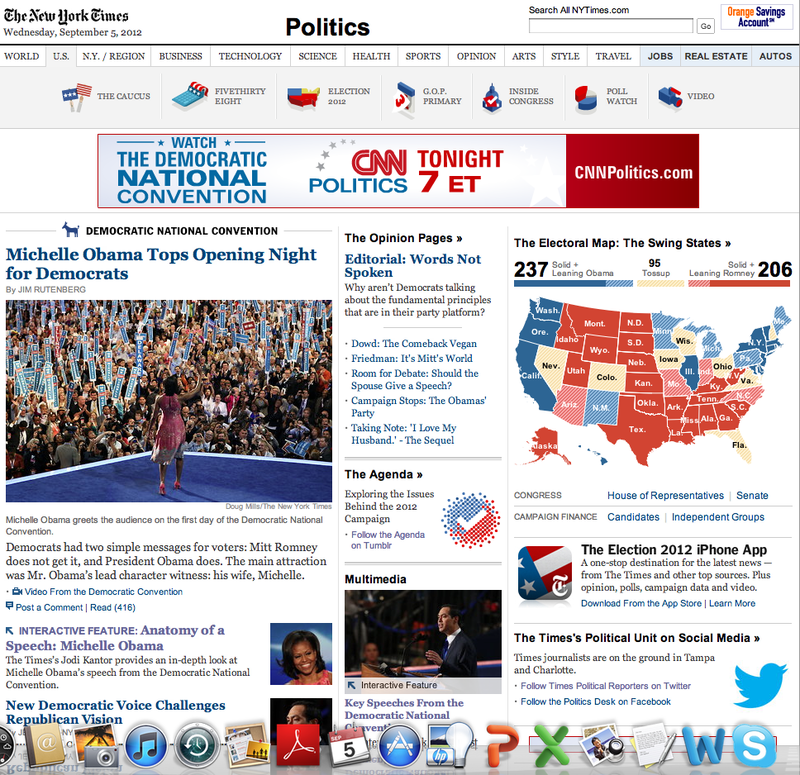 –a second ad from CNN in a box in the right column. –a couple of “house ads” touting NYTimes services, which bring in no money. –A “GoogleAd” for Trader Joe’s coupons. I have no idea how much revenue those ads are bringing in. All told, however, I am sure that they don’t amount to a fraction of the cost of putting all those reporters and editors in Charlotte, NC, plus the cost of the team in NYC who are helping out. For now, then, it must be acknowledged: the tools and the philosophy of online news have outrun the business model. This is impressive but not sustainable. Yet. Will it be self-supporting by 2016?